Bavaria is known everywhere for its Oktoberfest with Bavarian beer, Bratwurst, Ham Hocks, and Sauerkraut. Here in the USA it has become a traditional fest too. You can celebrate it in many US cities. If you create your private Oktoberfest try out this Bavarian Sauerkraut Salad. It's a proven and authentic German recipe. Happy Cooking! Sauerkraut is not only a side dish for bratwurst or mashed potatoes, it can be used for salads or soups as well. Sauerkraut is a good source for Vitamin C and is probably because of this reason very popular during the winter months (where you normally did not have the possibility to buy lemons and oranges). If you like Sauerkraut, you may want to try this recipe. - Peel apple. Grate apple and carrot, combine with Sauerkraut in a bowl. Before with a fork loosen up the Sauerkraut, and with a sharp knife cut it in smaller pieces. - Cut pepper in fine cubes. Slice spring onions. Add to Sauerkraut. 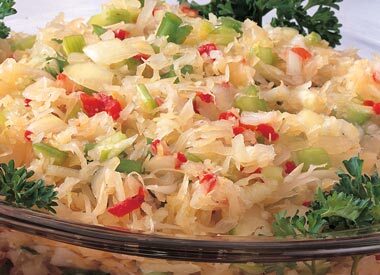 - Mix Sauerkraut mix with oil, spice to taste and keep the salad in the fridge for 1 hour. Then spice to taste again. The salad will need some time to infuse, so that all flavors can nicely blend. You can use this salad as a relish for German-style sausages on buns. A typical German barbecue would consist of bratwurst, Weisswurst or knockwurst. Serve the sausages with German mustard, German buns or other German style bread (Trader Joe has some good rye bread), potato salad, sauerkraut hot or as salad and if you like beer - enjoy some a glass of the famous Bavarian Hefeweizen. Make sure to use German Sauerkraut. Some American Sauerkraut contains additional chemicals and preservatives which might alter the taste. Thanks for letting me know. We have such stores here in LA, I will check them out. But it is really easy to make ghee at home.